I'm now out of the woods and catching up on posts and pretty much everything else in my (digital) life. I have a number of film shots of baked goods to share from the spring and am excited about continuing to do more. For now, though, I'll start here with a Rhode Island Apple Slump. As I mentioned earlier, this NELP, my friend Becky and I co-led the "Transcendental Kitchen Society," a 5-class workshop exploring transcendental ideas with a feminist lens, and examining the intersection between creative space and domestic space/daily work and intellectual work (read some words from Becky on the class and other feminist pursuits at NELP here). At all of our meetings, we engaged in some type of creative domestic work while discussing readings and ideas. For this particular class, in which we talked about Louisa May Alcott's Transcendental Wild Oats, a parody of her father Bronson Alcott's highly idealistic cooperative farm, Fruitlands, we made an Apple Slump. 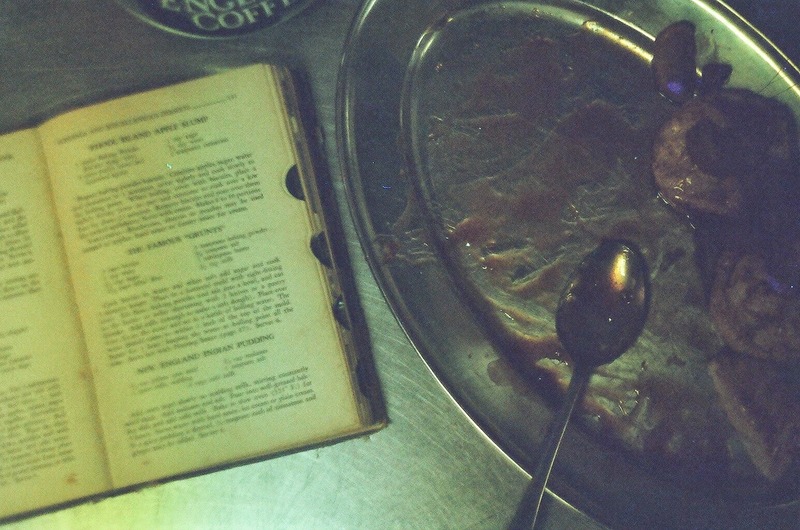 The connection between the text and the dessert appears in the final sentence of the story. Sister Hope--the analog for Mrs. Alcott and female protagonist who ends up taking on most of the domestic work of the commune while the men spend time "thinking"-- acknowledges the failure of the Fruitlands and wittily comments, "Don't you think Apple Slump would be a better name for it, dear?" A fruit slump, cousin to a pandowdy and British steamed pudding, consists of fruit simmered in a skillet, which is then topped with biscuits/dumpling dough and cooked until the dough is baked through. It's then inverted, with the fruit being spooned over the biscuits-- a cooked shortcake, of sorts (for more on slumps, grunts and pandowdys, see this New York Times article from last year). 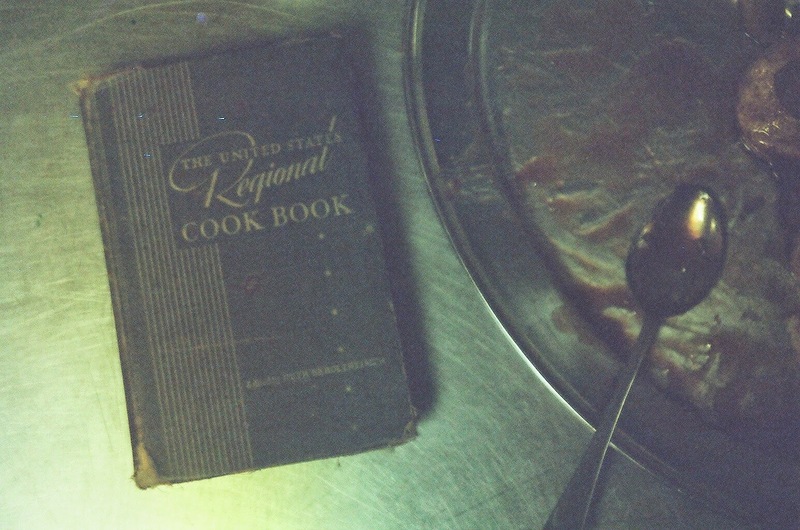 This particular recipe comes from Becky's 1947 edition of The United States Regional Cook Book edited by Ruth Berolzheimer. As many recipes of the era, the directions are not especially detailed or proscriptive--I added in a few details here, but it is meant to be approximate-- there's not much danger of failure. The apple slump's deliciousness exists in that tension between soft and doughy biscuits and the dark and rich caramelized apples. 1. In a 9-inch cast iron skillet over medium-low heat, simmer apple slices, brown sugar, water, and cinnamon until liquid is reduced and apples begin to soften. 2. Meanwhile, prepare the biscuits. In a medium sized bowl, combine flour, baking powder and salt. Cut in the cold butter, until mixture is the consistency of cornmeal and peas, then pour in the milk and bring dough together into a ball. Roll dough out onto a floured surface about 1/2-inch thick and cut into circles with a biscuit cutter or jar top. 3. Once apples are soft, place cut biscuits over the dough, cover skillet, and cook over medium-low heat until biscuits are baked through but still soft and apples are completely cooked and caramelized, approximately 20-25 minutes. 4. 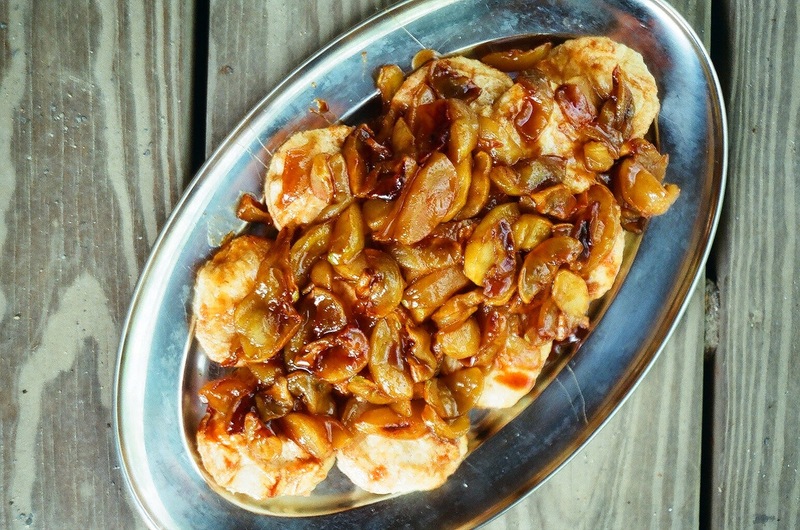 Remove biscuits from skillet and spoon caramelized apples over top. Serve with cream and enjoy warm. We warmed the cream in the skillet after the apples had been scooped out, so that it took on some of the caramelized flavor. We then drizzled it over everything. While the slump cooked, we also created a "dance" composed of actions from experimental recipes the workshop the students wrote for an assignment. 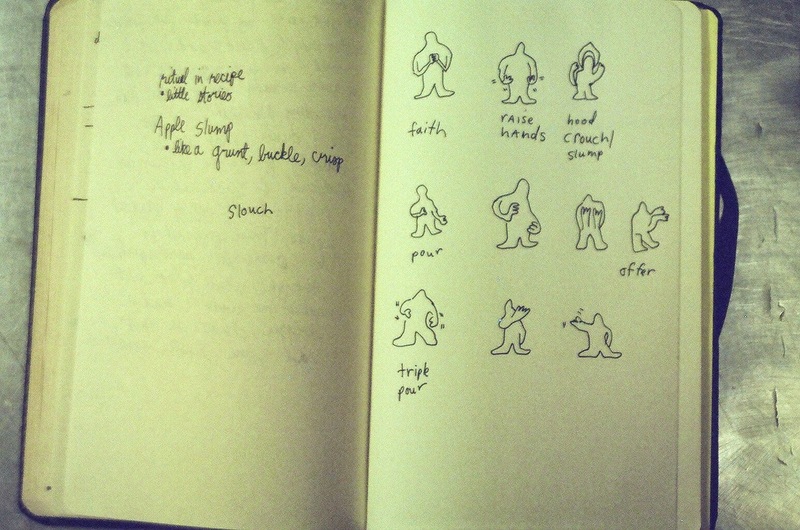 Rachel Pernick's wonderful graphic representation of that dance is pictured above.